Sydney and her mom Amy greet students during the book signing January 25. Sydney Thaxton encouraged students who attended the reading and signing of her book to write about something they like. The fifth grader did just that when she wrote Dusk, her first published book. She selected a story about a dog that was inspired by her own dog, Big Girl. 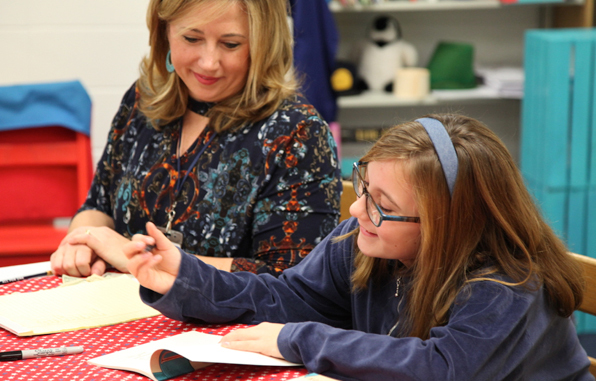 Fourth, fifth, and sixth grade students gathered with fellow JA classmate and author Sydney Wednesday, January 25 as she talked about writing, signed books, and read a chapter from her work that was published in late 2016. The signing was held in the Lower School library in conjunction with the school Scholastic Book Fair. Dusk tells the story of a Louisiana girl who is dealing with loss and the changing family dynamics that result. She finds friendship with a dog named Dusk. Copies of Dusk were available for $10 and 56 were sold. A portion of the proceeds went to purchase books for the JA Lower School library. Dog bone bookmarks were given to students to encourage reading, and dog treats were given to students to share with their pet friends. Sydney began writing around the age of 8, but this is the first work she has completed. She said her previous attempts were good practice for writing Dusk. “I started liking it the more I did it,” she said. The book took about two months to write.